Half pitch game. Set up two gates by the half way line as per the diagram. Play 15 mins then break for 2 mins. Play another 15 mins then break for 5. Coaches should have lots of spare balls available to allow continuity and to ensure intensity. Blues attack the goal, reds defend, yellows wait in their goal. 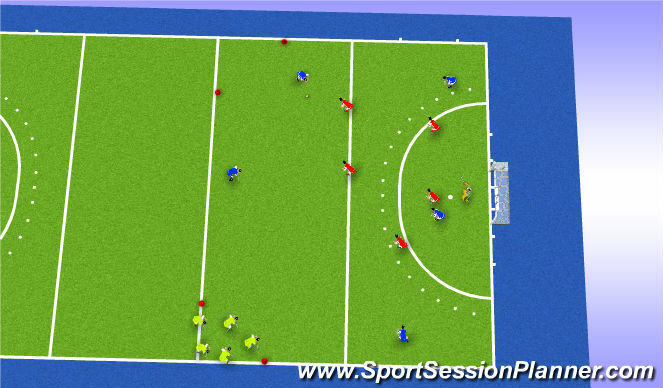 If they score by passing to the Yellows then the yellows attack the main goal and the blues defend. If they score by working the ball through the open gate they they instantly "turn & burn" and become the attacking side versus the blues. If the blues score then the reds play a hit out and the blues defend. Offense - Can we go forward quickly? Find /create space/overloads. Height/width/guard. Skills to enable quick attacking. Defense - Identify and manage biggest threats. Stop their go forward. Deny space. Pressure the ball. Win it back!! !